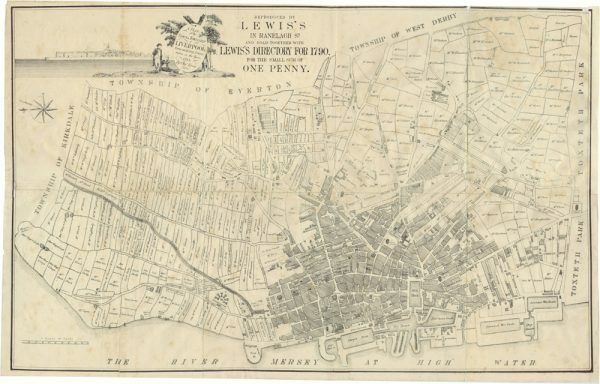 A stunning silk print of an old map of Liverpool, showing field owners and street names from the 18th century. 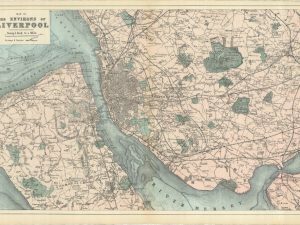 This is the oldest of the old maps of Liverpool available to buy on Historic Liverpool. It also rivals Ackermann’s Panoramic View of Liverpool for beauty! 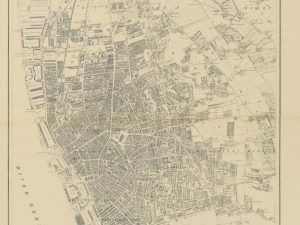 Charles Eyes originally surveyed it in 1785, publishing in 1790, and so the map shows Liverpool when it was a much smaller town. The famous department store Lewis’s produced a reprint in 1870 when they celebrated the 25th anniversary of their Rangelagh Street premises. 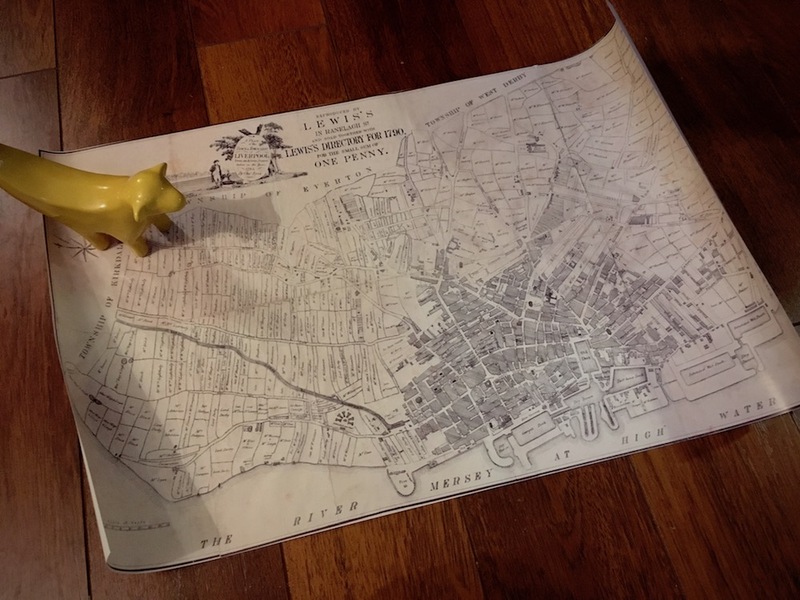 It’s this reproduction that you’ll get – a map now 150 years old itself! The Liverpool on this map is a small riverside town with big ambitions. The map covers the built up area plus miles in every direction. As such, we can see the Leeds-Liverpool Canal snake its way to the edge of town from the north. We also see dozens upon dozens of fields, each marked with their owners’ names. Some of the names are instantly recognisable to historians of the place: Mr Gildart, Lord Derby. Others we might recognise from the street names of today: Mrs Hardman, Messrs Williamson, Faulkner, and Seel. Mr Colquitt owns fields bounding Colquitt Street itself! This map is almost like a tithe map, and just as detailed. 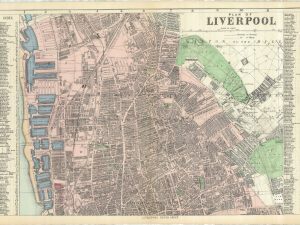 The extent of Liverpool is to the canal in the north, the end of Whitechapel in the east (to the top of the map) and half way along Duke Street in the south. Great George’s Street is entirely rural, as are Lime Street (‘Lime Kiln Lane’) and Scotland Road (‘Road from Kirkdale’). Of course, many things on this map look very different to the way they are now. There is a ‘Crescent’ halfway along Great Charlotte Street, where the car park to St John’s precinct is now. High Street runs straight through to Tithebarn Street, no Exchange Flags in the way. 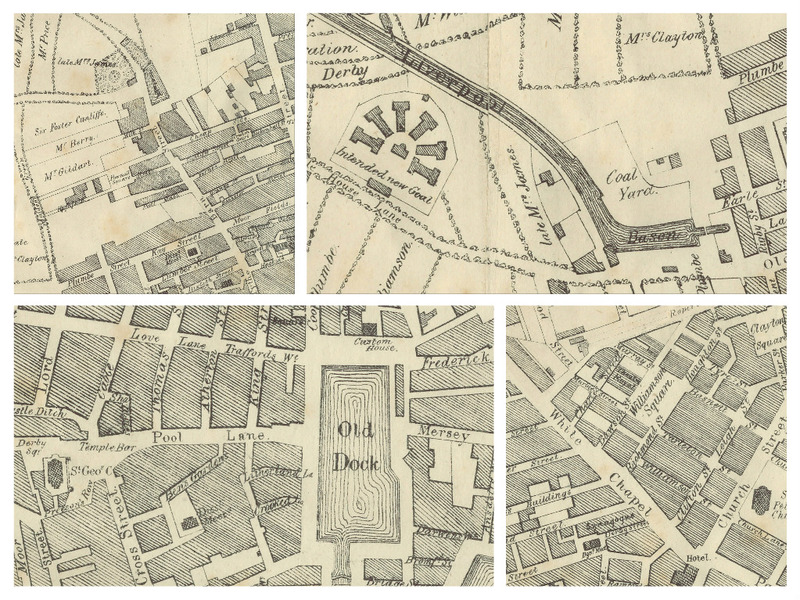 St George’s (Derby Square), St John’s (St John’s Gardens) and St Peter’s (Church Street) are all still there in 1785. There’s a field called Ladies Walk, much appreciated in Picton’s history of the city, which was a pretty tree-lined way from Old Hall Street to baths on the river front. That’s under the passport office and half a dozen lanes of traffic these days! Given the time in history, there is a fort just to the north of Ladies Walk, defending the Mersey from other European powers. But despite all this, Liverpool is recognisably Liverpool. The Old Dock is dead centre, Dale Street, White Chapel and Park Lane stand out to the modern viewer. The townships of Kirkdale, Everton, West Derby and Toxteth are marked around the edge of the map. They seem so far away! And already the main roads out to these areas are in place. No doubt you could navigate your way around much of the landscape. 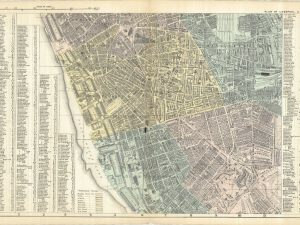 If you’re lucky enough to have traced your Liverpool family history back this far, this map is a great way to see the town as it was in those days. Your ancestors might have lived much more centrally than would be the case in the Victorian era, when vast numbers of terraces and courts swept away these beautiful fields. With the street names printed clearly, this could be an invaluable tool. This is a 150 year old map, of an even older document. It’s been carefully scanned, but it does show creases and foxing in keeping with an old map. Still, none of this detracts from the beauty of the thing. Unlike my other prints, this map is produced, not by me, but a fellow enthusiast Chris Hughes and sold with her kind permission. It’s printed on glossy silk finished paper at 170gsm. It’s printed without a border, and is suitable for framing.